For other uses, see Searchlight (disambiguation). The first use of searchlights using carbon arc technology occurred during the Siege of Paris during the Franco-Prussian War. The Royal Navy used searchlights in 1882 to prevent Egyptian forces from manning artillery batteries at Alexandria. Later that same year, the French and British forces landed troops under searchlights. Searchlights were installed on most naval capital ships from the late 19th century through WWII, both for tracking small, close-in targets such as torpedo boats, and for engaging enemy units in nighttime gun battles. The Imperial Japanese Navy especially was known for its intensive development of nighttime naval combat tactics and extensive training. The War in the Pacific saw a number of nocturnal engagements fought by searchlight, particularly the Battle of Savo Sound at Guadalcanal. Although searchlights remained in use throughout the war, the newly developed radar proved to be a far more effective locating device, and Japanese radar development lagged far behind that of the US. Searchlights were first used in the First World War to create "artificial moonlight" to enhance opportunities for night attacks by reflecting searchlight beams off the bottoms of clouds, a practice which continued in the Second World War. The term "artificial moonlight" was used to distinguish illumination provided by searchlights from that provided by natural moonlight, which was referred to as "movement light" in night-time manoeuvers. Searchlights were also heavily used in the defense of the UK against German nighttime bombing raids using Zeppelins. Searchlights were used extensively in defense against nighttime bomber raids during the Second World War. Controlled by sound locators and radars, searchlights could track bombers, indicating targets to anti-aircraft guns and night fighters and dazzling crews. Searchlights were occasionally used tactically in ground battles. One notable occasion was the Red Army use of searchlights during the Battle of the Seelow Heights in April 1945. 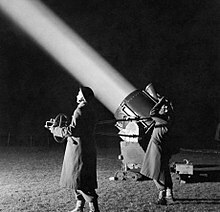 143 searchlights were directed at the German defence force, with the aim of temporarily blinding them during a Soviet offensive, begun with the largest artillery bombardment the world had ever seen until that point. However, the morning fog diffused the light and silhouetted the attacking Soviet forces, making them clearly visible to the Germans. The Soviets suffered heavy losses as a result and were forced to delay their invasion of the city. Second World War-era searchlights include models manufactured by General Electric and by the Sperry Company. These were mostly of 60 inch (152.4 cm) diameter with rhodium plated parabolic mirror, reflecting a carbon arc discharge. Peak output was 800,000,000 candela. It was powered by a 15 kW generator and had an effective beam visibility of 28 to 35 miles (45 to 56 km) in clear low humidity. The searchlight also found a niche for use by night fighters and anti-submarine warfare aircraft. The Turbinlite was a powerful searchlight mounted under the wing of an RAF Douglas Boston light bomber, converted into a night fighter to shoot down Luftwaffe night bombers. The aircraft would be directed in the general direction of the enemy by ground-based or metre-wave airborne radar, and the pilot would then switch on the Turbinlite, illuminating the enemy aircraft, which would then be shot down by accompanying RAF day fighters such as the Hawker Hurricane. This never proved very successful, as the light made the emitting aircraft a very big target for rear gunners, who would simply have to shoot into the light and be guaranteed to hit something eventually. During the Battle of the North Atlantic, RAF aircraft such as the Vickers Wellington were assigned to patrol for surfaced German U-boats at night, when they would be on the surface, charging their batteries. A large searchlight called a Leigh light was suspended from the bottom of the wing or fuselage, and would be used to illuminate the surfaced U-boat while it was being attacked with bombs and depth charges. The Leigh light was somewhat more successful than the Turbinlite, but in both cases the development of centimeter-wave radar proved to be the far more effective answer. 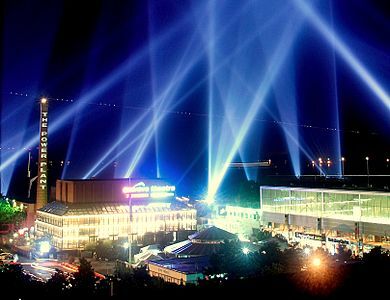 Today, searchlights are used in advertising, fairs, festivals and other public events. Their use was once common for movie premieres; the waving searchlight beams can still be seen as a design element in the logo of the 20th Century Fox movie studio, the Fox television network. 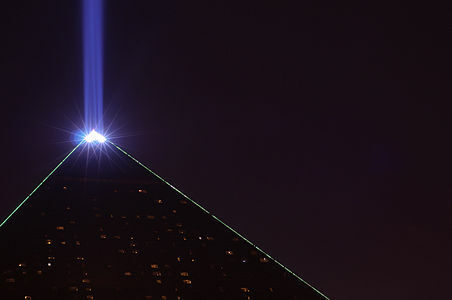 The world's most powerful searchlight today beams from the top of the pyramid-shaped Luxor Hotel in Las Vegas. The beam concentrates about 13,650,000 lumens from 39 7 kW xenon lamps into its beam of about 9,129,000,000 candela. The brightness emanating from the Luxor lamp room is about twice that which emanates from an equal area of the sun's surface (about 95,000,000 cd/ft2 versus 45,000,000 cd/ft2). The Tribute in Light is an art installation that uses two columns of searchlights to represent the former Twin Towers of the World Trade Center in remembrance of the September 11 attacks, produced annually in Lower Manhattan. ^ Stirling, Christopher (2008). Military Communications From Ancient Times to the 21st Century (First ed.). Santa Barbara. CA: ABC-CLIO. p. 395. ISBN 978-1-85109-732-6. ^ Sterling, Christopher H. Military Communications. ABC-CLIO. pp. 395–396. ISBN 978-1-85109-732-6. ^ Barry, Richard (1905). Port Arthur: A Monster Heroism. Moffat, Yard & Co. pp. 324–325. ^ "Artificial Moonlight". Tactical and Technical Trends. US Army Military Intelligence Corps (57). April 1945. ^ Welsh, William E. (June 2017). "Masterful Defense at Seelow Heights". Warfare History Network. Wikimedia Commons has media related to Searchlights. "Giant Lights Paint The Sky To Work New Magic" July Popular Mechanics—i.e. early article on one of the first commercial use of searchlights. German Searchlights, a 1943 article from the U.S. War Dept. This page was last edited on 10 April 2019, at 23:14 (UTC).